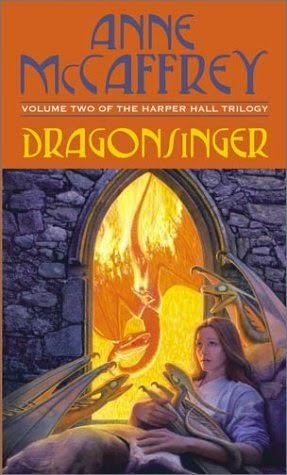 Dragonsinger is the second part of the second trilogy of the Dragonriders of Pern series. When I wrote about the first part of the trilogy, Dragonsong, I provided some context as to its publication. The same applies to Dragonsinger. Actually, in many ways both books resemble each other. When I started to read the book it quickly became apparent that it’s more of a continuation of Dragonsong than an actual sequel. However I do agree with splitting up the book in two as the first book focuses on Menolly’s life at Half-Circle Sea Hold and her eventual escape while the second book focuses on her arrival at the Harper Hall where she will be receiving her training in harper craft. I enjoyed my stay at the Harper Hall but I admit that I’m a little bummed out I was accompanied by Menolly the whole time. I like Pern, I really like Robinton and, more importantly, the storytelling in this book is enjoyable. It’s surprising that McCaffrey can write what more or less amounts to slice of life storytelling in an engaging way. There isn’t a villain, there isn’t a fantasy quest or many other science fiction and fantasy tropes. Instead, the book focuses on one of McCaffrey’s main themes: mankind’s ability to learn and improve. This theme is explored on a few levels. One the macro level, the series’ story, there are many elements in Dragonsinger that deal with the development of the Harper Hall with the inclusion of fire lizards and one of the most promising female apprentices. This also ties into the overarching plot of Pern’s reorganization after the return of threadfall in the Ninth Pass. On the micro level, the book’s story, Menolly actually faces a few challenges. Her reputation as a musical prodigy still holds up but she does face a few new challenges. She learns that she has limitations. She’s not particularly good at singing and one of her most valuable classes is singing lessons with Shonagar, the Voice Master. Another thing that McCaffrey did well was introducing and developing the Harper Hall. Again, this was important not only for Menolly’s story but also the ongoing narrative of the Dragonriders of Pern up to this point in the series chronology. In Dragonflight and Dragonquest the main focus of the story is on Benden Weyr and the Dragonriders. We’re aware of the existence and some of the roles that the craft halls have but this is the first time that a main story takes place within of the halls. It was interesting to see how the storytelling and the organization of the individuals who work and live at the hall resembled the depiction of schools for magic in works of fantasy. I’m not sure if it’s just me or if there really is a comparison that come be made with places such as Hogwarts from Harry Potter and the School for Wizards on Roke Island in the Earthsea series. It must be tricky to write about something not everybody is familiar with. Magic is one thing but music, even though not everybody understands and not in the same way, especially not classical music, must also be difficult to explain to someone who doesn’t have that training. McCaffrey is pretty adept at writing about music in a way that provides detail without overwhelming readers with it. Even though I didn’t fully understand all the musical details, it was enough to allow me to stay engaged in the story and even flesh out additional conflict between characters. That brings us to my main critique of this book. It has the same problem that Dragonsong had: Menolly is too good at everything she does. Menolly can’t fail and even worse than that she doesn’t even have to try hard. McCaffrey attempted to give her a handicap by giving Menolly an injury in the first book. She sliced her hand open while gutting a fish and she was poorly healed and her hand has scarred over, severely restricting the movement of her hand. Luckily, she’s so still that she can easily come up with variations that will accommodate her wounded hand while playing music on her gitar. Similarly, we learn in Dragonsinger that Menolly’s voice skills aren’t on the same level as her other musical skills. She’s given special one-on-one instruction by the Voice Master and in less than a week she appears to have mastered the art of singing. Menolly is so much better than everybody else that training to develop her weaknesses is easy for her. This kind of behaviour makes for very little conflict and personal growth. Instead of acknowledging her talents and using them in interesting or beneficial ways she’s glib about it. She acts as though she doesn’t realize just how good she is and it makes her unlikeable. What could easily have been an empowering story for young female readers turns into an exercise in arrogance and petty junior-high level drama. When Menolly dislikes a character it’s obviously because that other person is bad and deserves to be disliked. She’s never in the wrong and when others try to point out Menolly’s flaws many other characters come to her defence. The most frustrating quality that McCaffrey gives Menolly is her inability to understand her abilities in comparison to that of others. I think it’s supposed to make Menolly look like a nice person but it just backfires. Since I’m (re)reading the series in publication order, I’ll be reading The White Dragon next and taking a break from Menolly. I’m glad I read the first two books of the Harper Hall Trilogy as they’ve provided me with a different point of view on the Dragonriders of Pern series but they were also frustrating, albeit in different ways as the principal trilogy. To be clear, I like Menolly in small doses and I would love for her to be given a challenge worthy of her skills as she is quite capable but so far she’s just coasting and it’s boring and frustrating to read about. I’ll be glad to return to the rest of Pern as I’m anxious to read about Jaxom and his white dragon. I’m also looking forward to seeing how the story of Dragonquest continues to develop. I’ll be returning to the Harper Hall Trilogy with the final book, Dragondrums which thankfully deals with another character other than Menolly, Piemur a character introduced in Dragonsinger that I happen to like quite a bit. Here are some quick thoughts on the cover to my edition of Dragonsinger (pictured above). While I really like the Michael Whelan covers for The Dragonriders of Pern series it’s nice to have a cover by a different artist. 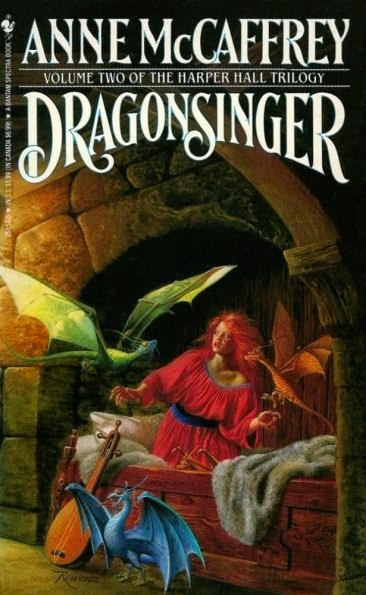 In this case, Elizabeth Malczynski, who also did the cover of my edition of Dragonsong. Appropriately the focus is on Menolly and her fire lizards. They’re depicted in a stylized way, with very lean and accented features, particularly the wings and the claws. The result is nice but otherwise unbelievable. Like many artists who draw dragons, regardless of their size, I find that the wings are unrealistically small. I find it hard to believe that they could actually take flight. 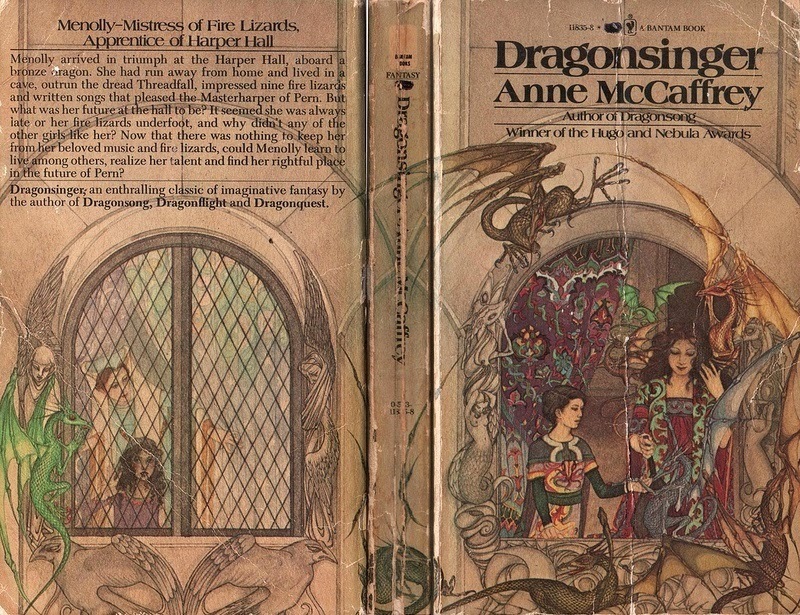 I’m a bit conflicted with this cover because while it’s a rather nice image with interesting details in the windows’ arches and the characters clothing and the scaly little dragons, it doesn’t do justice to the source material. I find it difficult to believe that there is such detailed architecture on Pern. Most Forts and Holds are carved out of mountainsides and it’s very hard to believe that such detail heavy sculptures were carved out of rocks which are likely sedimentary stone. Same goes for the clothing. Pern is a place where animal hide is a staple of everybody’s wardrobe. Fine dresses like the ones on this cover are likely somewhat rare to see. All of this nit picking doesn’t really matter because the artist gets the tone more or less spot-on. Menolly is pleased to be in a place where she feels accepted and many people at the Harper Hall are happy to have her. However, like the back cover shows, some people are less than pleased at Menolly’s arrival and serve as main antagonists to the story. The details might not be exact but the overall image works. My complaints are minor because I think I prefer a cover like this one knowing I have many other covers that portray the world of Pern a bit more accurately.